Adapted from “Walnut Husk Fly Trap and Low Volume Spray Study Update” by Janine Hasey, UCCE Farm Advisor, Sutter, Yuba & Colusa Cos, and Bob VanSteenwyk, Research Entomologist, UC Berkeley, in Sacramento Valley Walnut News, July 2014. Walnut husk fly (WHF) has begun emerging earlier in the Sacramento Valley than it has historically. We are revising the timing of when to hang traps to the first of June instead of mid-June. Timing of control relies on monitoring adults with yellow sticky traps baited with ammonium carbonate lures. Because the commercial WHF trapping system was not accurately monitoring WHF population emergence in 2011, studies were conducted in 2012 and 2013 to examine the effectiveness of different commercially available traps and lures. This article summarizes the 2013 trap study and low volume insecticide application trials. 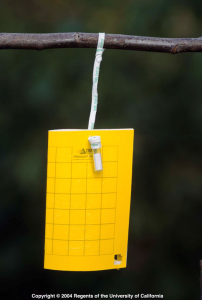 See the Walnut Research Reports for more information on the performance of the various traps and lures, low volume sprays, and insecticide efficacy; or read here for information on WHF biology and spray timing. A trial was conducted in a commercial (Payne) orchard in San Benito County. Eleven trap and lure treatments were placed about 6 feet above the ground. All traps were checked and trap positions were rotated within the block weekly to correct for position effects. Traps were placed in trees 27 June and were monitored until 11 September. Traps were changed either once a month, when traps captured over 100 flies, or when the yellow panel surface lost its stickiness. UC Super-charged lures were changed weekly and all other lures were changed every four weeks. Since this is a summary article, only the data for the standard trap/lure and trap/lures found to be most effective are presented. Results: Female/male trap catches – AS-Alpha trap/lure performed better than the T-Carb, with higher female and male catches. S-Sut trap/lure also captured more females than T-Carb but did not capture more males. AS-Mega however, did not catch significantly more females or males than T-Carb (Table 1). Total trap catches – The AS-Alpha captured significantly more total WHF than AS-Mega and T-Carb while S-Sut was not significantly different from any treatment. Trap differences – In 2013, Alpha Scents and Suterra traps captured more flies than Trécé traps, regardless of lure used. This result was different from the 2012 study where no difference was observed between the Alpha Scents and Trécé traps. Other observations – We saw a decline in female captures of the population through the season that was also observed in 2012. The AS-Alpha , S-Sut, and AS-Mega were the most effective trap/lure combinations. The increase in trap/lure effectiveness was related more to lure efficacy although the Alpha Scents and Suterra traps captured more WHF compared to the Trécé trap in 2013. 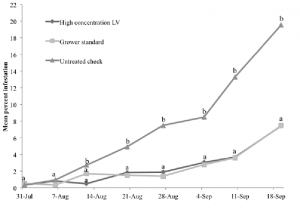 Studies were conducted in 2012 and 2013 to determine whether WHF control can be achieved with a new low volume technique (10 gal/ac using skip row) as compared to conventional application methods (100 gal/ac to every row). Grower standard (GS) at 100 gal/ac, applied to every row, driving at 2 to 3 mph. Low volume (LV) at 10 gal/ac, applied to every other row, driving at 4 to 8 mph using the same amount of toxicant and bait on a per acre basis as GS. The GS treatment was applied with standard air-blast speed sprayer delivering 100 to 125 gal/acre and operating at 2 to 3 mph. The LV treatment was applied using modification of the standard grower’s speed sprayer. All but the top two nozzles were closed and the two top nozzles were replaced with ¼ in. barb adapters. The barb adapters provided two high-pressure, solid streams of toxicant that were directed toward one another to meet about 10 to 15 ft. in the air. Upon meeting, the fluid dispersed in large droplets. Air baffles were adjusted to direct the air-flow vertically, enabling the fan to drive the toxicant 40 to 50 ft. in the air before subsequently spilling back over the tops of trees. The output of the two nozzles was measured and paired with an increased tractor speed between 4 to 8 mph that produced the desired output (10 gal/acre). The speed was determined by the grower and was based on orchard floor conditions and grower and equipment safety. Treatments were applied two weeks after the first fly captures in the adult traps in each orchard and the LV and GS treatments were applied on the same day. Each orchard was treated 1 to 3 times throughout the season with untreated plots treated in Linden and Modesto in late August due to significant WHF infestation. Results: There was no significant difference in the number of WHF captured among the three treatments in 2013. The LV and GS treatments were effective at suppressing WHF infestation throughout the season. The 2012 and 2013 data were combined and is shown in Figure 1. There was significantly lower infestation in the LV and GS treatments compared to the untreated check and there was no significant difference between the LV and GS. Figure 1. Mean percent WHF infestation per week for 2012 and 2013 combined in various locations, California. Low volume (10 gal/ac) applied at 4 to 8 mph was as effective controlling WHF as standard volume (100 gal/ac) applied at 2 to 3 mph using the same rates of insecticide and bait. The modification of the equipment is very minor and inexpensive. The LV technique is most effective in mature orchards with minimal canopy closure and a smooth orchard floor. Thus the LV technique is a viable option that can reduce the time and cost of application while maintaining or improving WHF control.